Until recently, people that purchased scales were faced with an important decision. Did they want a scale that gave them a very fine resolution or did they want a scale that had a high capacity? You couldn’t have both because the heavier the load, the less precision a standard load cell could deliver. However, at Arlyn Scales, we have changed that and made it possible for you to have both high capacity and high resolution/accuracy at the same time. We have been a leader in weighing solutions for the past thirty years. Arlyn Scales maintains its place, despite very fierce competition, because we always look ahead to what various industries may need or want from scales in the future. We invest a lot of resources in technological innovations so that we can exceed customers expectations and work to bring scales into new markets for a variety of emerging applications. We also manufacture our scales at our factory in Long Island, New York where our company is located. Because both the business and manufacturing sides are located together, we are able to sell factory direct to our customers. This means that our customers receive a hefty discount and savings that would normally have gone to the middleman. We take our savings from the factory direct shipping and put it right back into our design and manufacturing processes and procedures. This means that our customers get an even higher quality scale at a bargain price. Prior to our recent technological breakthroughs, achieving extremely precise weight measurements were simply not possible with strain gauge technology. This was due to the design of the strain gauge load cell. The strain gauge load cell has been the standard load cell of the industry for the past sixty years. It’s fabricated with sections that include a thin piece of metal. The spring element within the load cell resembles a miniature diving board and is attached to the scale between the bottom of the scale platform and the bottom of the scale. The spring element bends under the weight of the object placed upon the scale platform. When the spring element bends, it forces the flexors and strain gages to bend, and that creates electrical resistance within the strain gages, which is sent to an Analog to Digital converter, converted into a digital signal and sent to the digital indicator, where it is displayed numerically. One of the major problems with strain gage load cells is the material many manufacturers use in their construction. While aluminum definitely has its place in scale design, using it for strain gage load cells benefits no one but the manufacturer. While it’s inexpensive to tool, it leaves the load cell vulnerable to damage from shock and overloading, which ultimately affects the accuracy of the scale. Another problem is the resolution strain gages can achieve. Even with our superior construction and design, strain gages simply aren’t capable of very high resolution measurements at higher capacities. The alternative to strain gage technology, until now, had been magnetic force restoration (MFR) scales, which use electromagnets to weigh objects on the platform. They do not have the vulnerable load cells and could deliver highly accurate results. However, it was extremely sensitive to temperature and air currents in the working environment and that could cause drifts in accuracy. Additionally, they cannot provide high resolution for larger capacities. These scales are also far more expensive than strain gage load cells both to purchase and operate. Thanks to Surface Acoustic Wave (SAW) technology, we have been successful in solving the resolution/capacity conundrum. Our line of Ultra Precision scales utilize SAW technology in such a unique way that we were able to gain international patents on our design and can now offer high resolution and precision at capacities that have previously never been possible. The SAW load cell is not just a souped up version of the strain gage load cell. SAW technology completely replaces the strain gages. Instead, two transducers are affixed to either side of a thicker spring element. One acts as a transmitter and the other a receiver. The transmitter sends a SAW wave to the receiver, where it is amplified and sent back to the transmitter. This happens continually. When an object is placed on the platform, the spring element bends and the distance between the transducers increases. When the distance between them increases, the frequency of the loop changes. By digitally measuring the frequency, we can determine the weight of the load. SAW load cells are inherently more accurate than strain gage load cells because there is no analog to digital signal conversion that needs to take place. They are less affected by changes in temperature and air currents and are more stable over time. The thicker spring element means that measurements are less subject to distortion. Accuracy falls between the 1:100,000 to 1:200,000 ranges. Resolutions can be as high as .0001 while capacities run up to 500 pounds. By using one of our ultra precision scales in conjunction with our setpoint controller, you’ll be able to batch various types of petrochemical, chemical, pharmaceutical, and paint formulations and automate this process to eliminate human error and increase productivity. 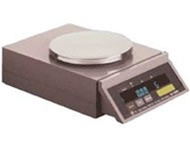 With this type of automation and a variety of computer options, the high capacity ultra precision scale can take your finely detailed work and make your business an even greater commercial success. Our courteous and highly trained customer support staff will be happy to answers any and all questions about our strain gage and ultra precision scales. If none of our standard models is quite what you’re looking for, be sure to ask us about our custom solutions. For more information, use the form on the Contact Us page of our site or give us a call at (800) 645-4301.